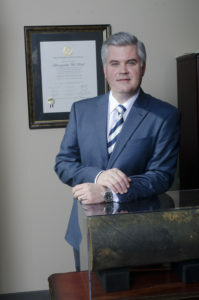 Marquette Wolf began working for the firm while attending the Southern Methodist University School of Law. Since then, he has handled dozens of jury trials to verdict and cases in arbitration, gaining critical expertise representing clients in major cases. Marquette played a key role in the groundbreaking Smalley vs. Koch case, which resulted in a major judgment for our client. Marquette has successfully tried to verdict pipeline explosion, refinery explosion, wrongful death, business dispute, environmental contamination, elder care, medical malpractice, consumer rights, catastrophic personal injury, product liability, premise liability, fire/death and child abuse/neglect jury trials, and won. Marquette also served as District Attorney Pro Tem for Dallas County, prosecuting public integrity cases against current and former law enforcement personnel in Dallas County.